Saturday, 10/31 -> So What! 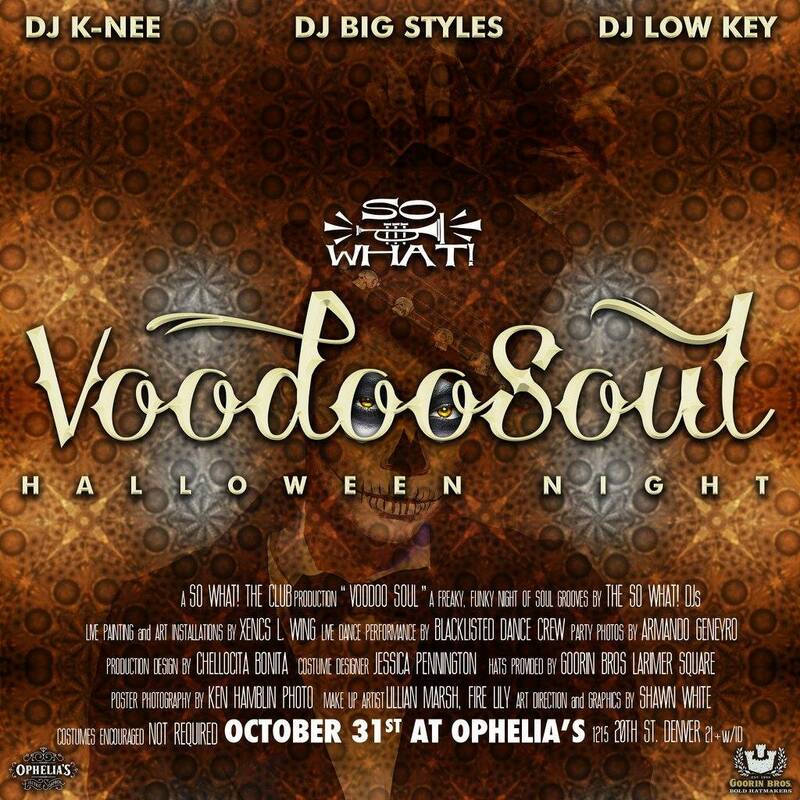 Voodoo Soul at Ophelia’s w/DJ K-Nee, DJ Big Styles & DJ Low Key! Live dance performances, live art from Xencs L. Wing, photos by Knower Of The Ledge & more to celebrate Halloween night!!! SATURDAY, 10/31 -> Something wicked, this way comes…A Down & Dirty night of Bone shaking Vibes to funk up your Halloween: So What!’s VOODOO SOUL!!! The So What! 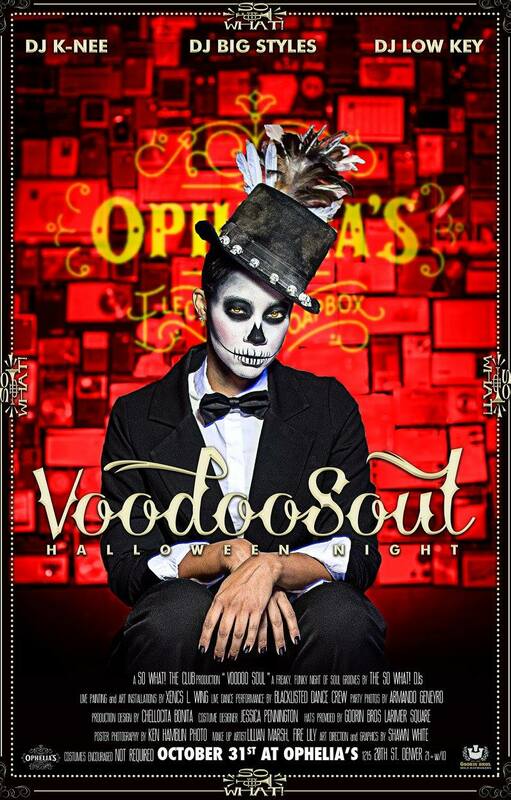 DJs return to Ophelia’s pulling out all the stops to take your Halloween to the next level! Please if you are coming BUY YOUR TICKETS EARLY!!! Tickets prices go up on Halloween so buy your tickets in advance and guarantee your entry! Of course the So What! DJs will be burning down the house with the freakiest, funkiest soulful dance grooves north of New Orleans and we have loads of surprises in store for you! All Funky People (over 21) are welcome and COSTUMES are encouraged but NOT NECESSARY! Ophelia’s is the most beautiful room for music in Denver, it is also one of the city’s hottest restaurants. For those two reasons advance tickets are available, only $10 and RECOMMENDED! Doors open at 8, and it will be packed EARLY!! If you would like to sit at a table by the dancefloor it’s a must that you make a reservation. Call Ophelia’s at (303) 993-8023 to make a reservation, they are super nice!! 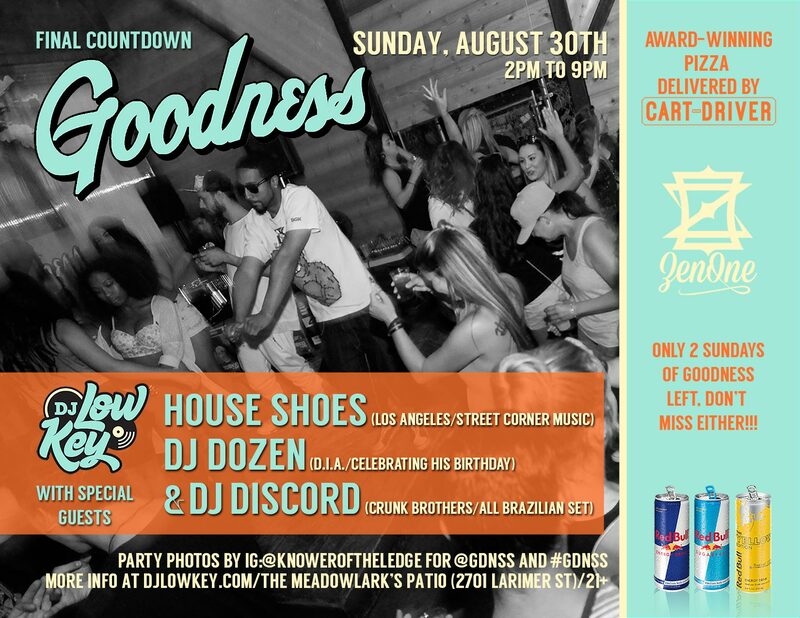 Sunday, 8/30 at 2pm -> Final Countdown Goodness w/DJ Low Key, the legendary House Shoes (L.A./SCM), DJ Dozen (celebrating his birthday) & DJ Discord (playing an all Brazilian set)! Pizza delivery by Cart-Driver, photos by Knower Of The Ledge & more on the second to last Sunday of this season on The Meadowlark’s magical patio!!! 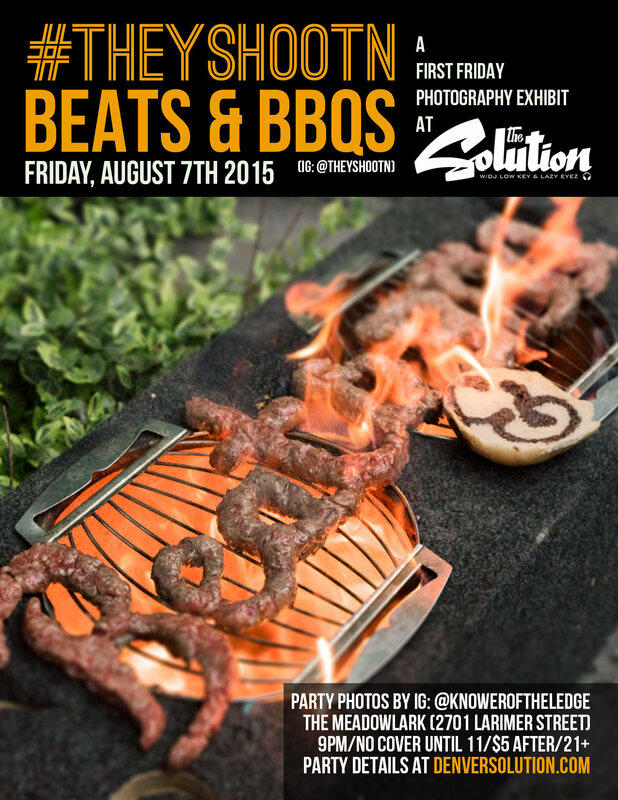 Friday, 8/7 -> #TheyShootn Beats & BBQs First Friday Photo Opening at The Solution w/DJ Low Key & Lazy Eyez! Check out the ridiculous exhibition featuring Knower Of The Ledge, Blake Jackson & many more top Denver photographers all month at The Meadowlark!!! 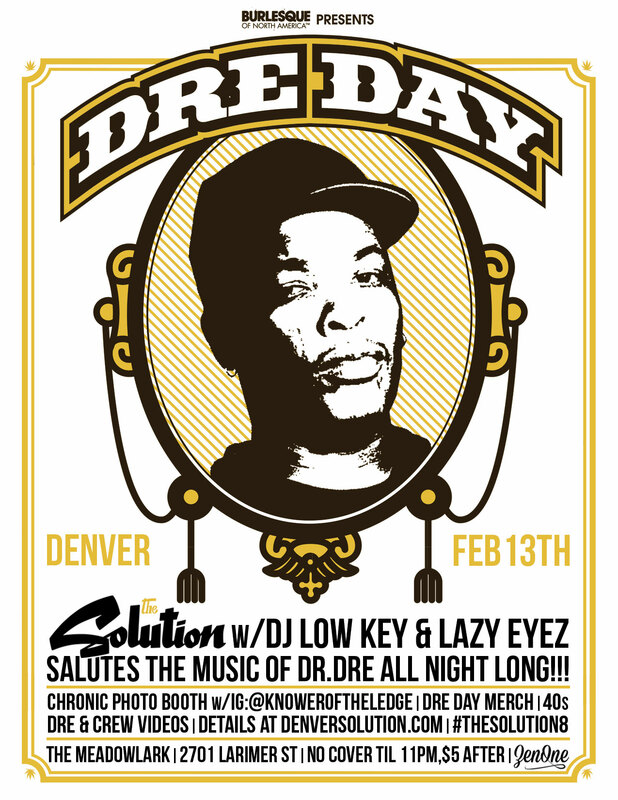 Friday, 2/13 -> Dre Day Denver 2015 w/DJ Low Key & Lazy Eyez, The Chronic Photo Booth w/Knower Of The Ledge, 40s, Dre Day merch, Dre & crew videos, ZenOne & more at The Meadowlark!!! Everybody’s celebrating! Friday, 1/9 -> Special guest Clockwork DJ (Mac Miller’s DJ) + Blake Jackson Photo Exhibit Opening at The Solution w/DJ Low Key & Lazy Eyez! Don’t miss 4th Wall:Rogues & Heroes throughout January at The Meadowlark!!! 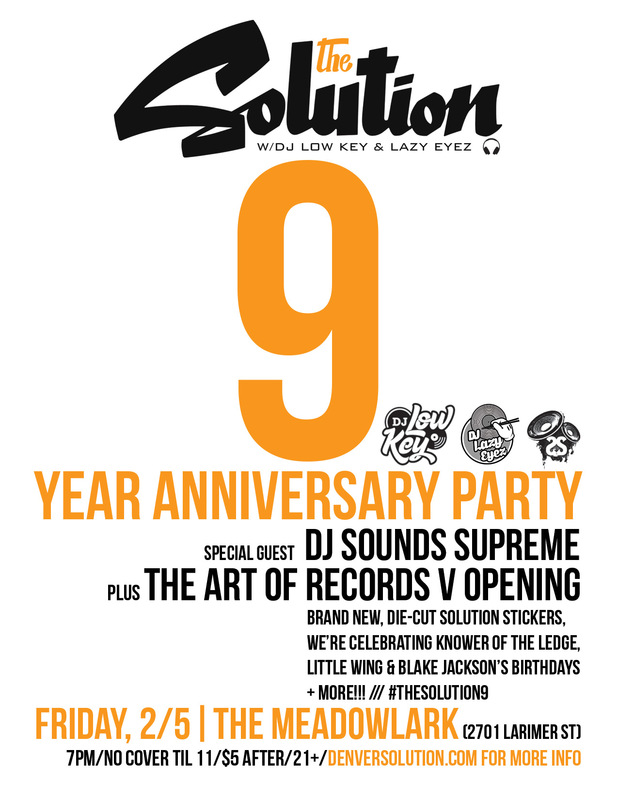 FRIDAY, 1/9 -> We’re excited to keep last year’s momentum going full speed ahead with an extra dope double feature of fun at The Solution w/DJ Low Key & Lazy Eyez! First off, we’ll be welcoming longtime friend of the party, Clockwork DJ (Mac Miller’s DJ / Most Dope Crew) over to spin after the Mac Miller concert, and since the show’s just Clocks and Mac, he’ll be over early for the afterparty!!! As if that wasn’t enough, we’ll also be opening January’s art feature at The Meadowlark, 4th wall: Rogues & Heroes, a photo exhibit by Blake Jackson! Head over to Blake’s Instagram to get more familiar with the super talented photographer’s work & make sure to check his exhibit some time in January 2015. As usual, your Solution residents DJ Low Key & DJ Lazy Eyez will be on the turntables, Armando Geneyro aka Knower Of The Ledge will be taking party photos and we’ll be rocking all the best in hip hop and more, all night long! 9pm / No cover until 11pm / 21+ / 2701 Larimer Street.